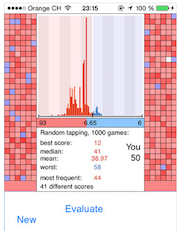 Gallery Solitaire is a clever game for a short break with serious addiction potential. You can compare your efforts with the results of strategy-less play: the program just taps randomly on playable cards. It does this many times, starting with the exact same starting situation as yours. You don’t have to spend time on obvious moves; the computer will make those for you. At every moment, the program shows you all playable cards. 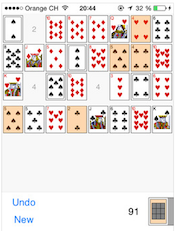 Just tap on a playable card: it finds its correct position automatically. 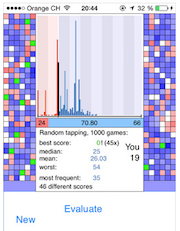 You concentrate on selecting the playable cards in optimal order to avoid blocking situations and to achieve an excellent score. The program saves all results (including the comparison results) and does statistical evaluations on this data. I had been hoping someone would develop this for iOS for years. 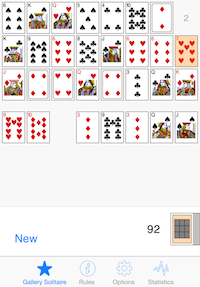 In my opinion, this is the most complex, satisfying solitaire card game in existence, and perfectly suited for iOS. The implementation here is quite solid, and includes the stats that have always made the game especially fun for me. (...)"
The game is implemented in Processing.js, the source code is available on GitHub.